Sadistically empty, I drove slowly and carefully to work, owing to the hurt that had alienated me from the world so nonchalantly, bashed me in the world of chaos, sans sanity, in the void-ness and emptiness. Hollowness erupted from no-where and wrapped me in its venomous spirals of smoke – of nothingness! I asked why. It dawned upon me like sun and shone, the physical hurt, the emotional hurt and physiological hurt. The last being when you’re so hurt that it shows as rouge on cheeks. Ache was spilled on my skin as goose-bumps and beneath it like blood, inseparable from the flesh and bones. The big suction; and every pint of hope were sucked out of me, leaving me floating in the vacuum that remained, I wondered why. So when tonight, I opened the windows, to blow a goodnight kiss, winds rushed in, they brought with them the tears that fell from your eyes into the abyss of loneliness, the words that escaped from your lips to form my name in whispers, the sadness that lingered in the silence of your sobs and some raw broken memories that littered the crevices of your incomplete room. I now know, the why – because you had cried. ps. This is half fact, the driving bit, and everything else is fiction. pps. It might be a little non-coherent and you’d have to read twice for that 🙂 and i would love if someone suggests a name for me? The Legend of Saif-ul-Muluk Lake. The jeep slowly stumbled on the narrow ascending paths, the apparently bottomless chasm was right next to the road, a little mistake and you could be buried in the void forever. I shuddered at the thought, of the void, of being buried, of for ever. The snow crested peaks were visible through the window panes and I feasted my eyes with this heavenly sight. Maria was almost snoring on the next seat, a slumber induced by the anti-allergic she’d taken before the ride to counter her fear of height, she hated missing delights of the journey. But things never always happen the way we want them to, and it was better to get used to of it. The college had ended and we were allowed to have a one week vacation at Rehman Uncle’s, Daddy’s childhood friend, place in Naran (a hill station in Pakistan). July in Naran is refreshing, vivid and exceptional, the blue birds hover over the dwellers and squirrels squash the walnuts mourning the fact that spring has come to them when summers should and the fact that summers will never come at all, the sun will never shine bright, but yellow butterflies kiss the red flowers and daintily steal their nectar, leaving them nodding in intoxication! And pine cones litter the steep hills. The jeep crossed the brinks of city with people who breathed, smiled and cried at the same time, who, in the wrinkles of their faces held deep lachrymal grief. Their cloudy eyes told strange lore of yore and they wore sad grimace, I wondered how they were able to hold secrets, of long forgotten past and of uncertain future with which a lot of hopes and dreams were associated, of which very little would be realized, this is the sad part of dreams, only few come true, and the sadder part is that you never know which will be the lucky ones. So as the fleeting scenes whispered to me I thought all the random thoughts, impossible and not-so-possible thoughts of the past, the present and the future that these valleys had and will witness. The same feeling would cross us again the next day, on an excursion trip of the Valley, walking along the narrow pathways on the steep hills where yellows flaunted in green, we would feel the air heavy with eeriness, drenched by love, which stayed like fog, we could smell it, we could feel it, we could taste it but we couldn’t see it, however, like fog, it blurred everything else. Love stayed there and settled on the stone as growing velvet moss, on petals as droplets, and beneath the sea in an oyster, the making of a pearl. And nature, then, decided to reveal onto us the deep dark secret which was caged, cursed and forgotten, in immaculate shadows of time. It kept lurking inside the bellies of streets and buildings like unborn babies in their mothers, like words in the tips of pen and the liquid medicine in the syringe. Back then, we didn’t even have the slightest idea that we were about to find out the most chilling of the stories that these hills had ever seen. A love story. Of a girl who dreamed of a prince who’d sweep her off the floor on his white steed. And a Boy who bore magic in his eyes, the eyes in which, one day, she would lose herself. The rest is history. It is of little significance that how we found the story teller in the street of a local market and how we persuaded her to narrate to us what happened to Raimeen, who would meet Ayaan, in her father’s library, on a chilly winter’s night when every one else had been marinating in their blankets, when the temperature outside the heater-warmed doors-and-windows-closed room, was less than -2, and every normal person would have thought of sleeping, the night when the maid was burning with fever and in order to fetch the next part of the book she had been reading, Raimeen would have to go to the library herself and she did, She, the crazy -bushy-haired, a pimple-scared nose, orange sweaterd, and light green dress clad – which bore orange beads onto it, like lambs bore that slaughtering fate, came out of the room and walked to the library, life was easy then. Love was inevitable. Ayaan, a member of the family of Behzad’s friend, was invited to quench his thirst of knowledge from Behzad’s collection of books. He had deep blue eyes that sparkle with pain in them, dreams in them and ebb and flow of love; in which, she, with all her might and her virgin heart, drowned without trace. Behzad Tirmizi was an Oxford scholar, very enlightened when it came to English literature, his only love, and very conservative when it came to his family. His girl-children were allowed to study as much as they want, and they could benefit from his large collection of books but were not allowed to go out the Tirmizi palace, an old teacher, well versed in all what the children were required to learn, would come daily to teach them. The only exception to the rule was going for a walk to Saif-ul-Muluk lake, which was hardly 5 min away. He didn’t know that the only exception would bring havoc to the family. Raimeen was youngest of her 5 siblings, three boys and two girls. The youngest, the most mature, the most silent and the most astonishing. Many years later when I would hear the story I would wonder if she was the most daring and most rebellious too? Having taken the steps which would be considered blasphemy? I think yes, she was superlative of all the good adjectives and superlative of what was good according to her. She had strange aura about her chiseled face of bitter sadness, of bitter-sweet loneliness, of hopes that she knew would be futile, she still lingered on, waiting for miracles to happen praying that they might happen soon. Back then, no body knew that she had dimpled smile only because no one had ever seen her smiling, her mother must had a memory of it, of her early childhood when smiles were as normal as breathing, but now it had been so many years of her mother’s death that hardly anyone had a clear memory of it. So as Raimeen crossed the threshold of girl-hood she stopped smiling and speaking altogether. But she had deep-dimpled smile and light brown eyes, which anyone could mistake with honey, but no one noticed, no one paid attention to such minute details about her. May be it was because of other people’s oblivion that when she embraced drastic changes about her and when she started signing and smiling no one noticed. Her room was the last in the alley, the last and the smallest, it was justified because she was the smallest too, it had large windows from which the world could be seen, her world, of thick bunches of flowers, of far away mountains, birds, bees and butterflies. She would sit by it to listen to all the sounds, of animals and of water rushing by, yearning to meet the sea. She would sit there and read books after books, wondering how the places, which were described in them, would be like? And the sheer delight of reading would cultivate in her the desire to weave words herself, just to see if they were equally beautiful or not, and she had taught herself to paint the things she so love just to see if they were captivating enough or not, they always turned out to be masterpieces. 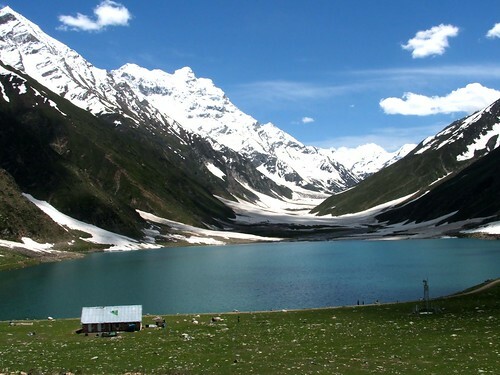 Many weeks later, when the spring had painted the ambiance with all the divine colors that the benevolent umber had sprinkled and when Behzad was out of town, she would sneak out clandestinely to the banks of Lake Saif-ul-Muluk, where, as the legends says, Prince Saif-ul-Muluk, on one moon-lit night, had witnessed the mystic descend of fairies and where He had lost his heart to the most beautiful of them, and where many years later Raimeen would sit, to recite her poem to Ayaan, because he was the only one who’d listen to her and as she believed, would understand her. Love stretched beneath her skin, she detached herself from the real world and started living in the place beyond anyone’s grasp, breathing in the shades of dreams, yearning for impossible, of being with him, of loving him by looking at him. Impossible. And when love enslaved her and she lost her heart to a random someone who had deep blue eyes and coarse voice, she wore flowers in her hair, bangles in her wrist, put henna on her palm, and kohl in her honey-colored eyes, and the mirror of her room would bear a lot of lip-shaped lip-stick marks on it, light pink and glimmering red, may be the love for him had also developed in her the love of herself. And very intense. For many months that would follow; she had kept meeting him, beneath the sky full of stars and yearned to count all of them with him by her side. She continued listening his travelogues, of far away places with strange sounding names, of which she would dream flying over with him, and hidden in the vine creepers where little pink flowers would loom to acknowledge love and where butterflies would spread their wings to take them to a forbidden penumbral shadows of light, of dreams, of ever-after and beyond, she would sing for him Tennyson and Browning. Listening to that we wondered if we were allowed to be a part of it, A part of her exquisitely protected secret? Were we trespassing the area which was not allowed to see/feel/taste/touch? The clouds descended on the hills which had steep slops, narrow alley and horses whining, which had seen her running aimlessly following the butterflies with him, which would see many other heart-wrenching scenes too. No body knew anything then, but it would come soon, Sooner. Their second-last memory was of hostile Him, the shouting, screaming and yelling him. Of a hand caked with mud and blood that wanted to get bloodier, thirsty of hers, his, their story! The bare bloodiness lingered and she was shocked, so shocked to tear-shedding, pleading and beseeching. There was a wilder man, psychotically wild and obnoxious on the horse. And a protecting Him. Fearless, with deep blue eyes, in which she had drown without trace. Their last memory was of some inaudible curses thrown in their direction and the bullet that followed and pierced his chest, her last memory was seeing him fallen down, of a bitter tear drop lingering at her jaw-line and before anyone could do anything her grieved heart shattered in myriads of shreds, she looked at the skies and fell the same spot, dead! The teardrop wailed and fell down. No ritual was performed; and no funeral was conducted. A grave was dug with sheer loathe and the bodies were dumped into it as trash. That would be their together forever and beyond. But that’s not the end of it; precise two days after it, when the air was thick with melancholy Tirmizi Palace shrieked and crumbled into debris. All the dwellers died buried in the life-less bricks. Nature has its own ways of revenge. And even now, many years after that, when ever the moon rises and dances on water, distant sounds of giggles, of bangles and rhythm of flute are being heard. The place where her tear had fallen, now flow the most beautiful spring of sweetest water in the valley. (Thankyou for the patience of reading it. I’m not very good at writing stories like that, your critic will be valuable for me. Help me improve. The gross silence silhouetted at every wall of this room, only broken by a random cricket’s crackle. The moth of loneliness slowly crawled over my heart and filled the room. Every wall. Every corner. Dreams tiptoed from my eyes, stumbled at the cadaver of night, fluttered their wings and flew out from the window of reality; to a place where everyt hing was possible and nothing was unreal. minute, second by second. The stars would suddenly stop glowing, the winds would stop blowing, the haunting screaming beseeching memories and darkness would prevail, more eerie, more dark, more life-like – sad and drenched. The loneliness would kneel in the middle of my room and would sob away to eternity. The dreams on their way back to eyes would stun themselves against the window pane. And their corpses would litter the floor.